V-Tech Auto Service provides excellent paint jobs and even provides a warranty to back it up. They even provides door-step pick-up and delivery service of your vehicle for zero hassle. 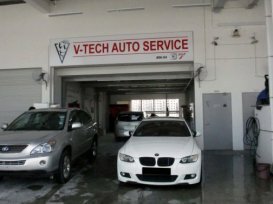 V-Tech also provides body-kit installations and vehicle repairs. Other services they provide includes panel beating and insurance claims. So if you are looking to make your precious ride look more attractive, what are you waiting for? Call V-Tech Auto today! Customer satisfaction guaranteed! We offer high quality auto body repairs, panel beating and spray painting services on all passenger and commercial vehicles. The following is a list of our services.